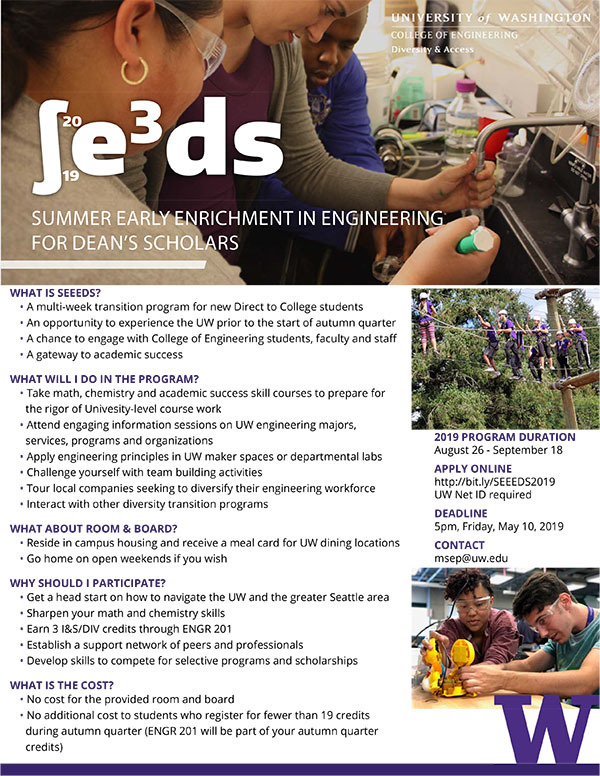 Through the Summer Early Enrichment in Engineering for Dean's Scholars (SEEEDS), incoming first-year students get a head start on experiencing the academic rigor and pacing of prerequisite courses at the UW. Open to select students, the program welcomes students to live in on campus, attend classes in Loew Hall, and eat at student dining locations on the Seattle campus. SEEEDS students gain an academic edge needed for success in UW Engineering and the opportunity to learn from faculty, students and staff. Plus, by arriving on campus before move-in day, students get a head start on learning to navigate the campus! Please note: STARS students are not eligible to participate in SEEEDS. Take math, chemistry and academic success strategy classes. Attend engaging, informative sessions by the UW Office of Minority Affairs & Diversity, the UW Instructional Center, the Center for Learning & Undergraduate Enrichment, and others who can help you adjust to the UW. Meet new friends, learn about life as a UW Engineer, and prepare to "slay" during your first year. Applications due: Friday, May 10 at 5:00 p.m.